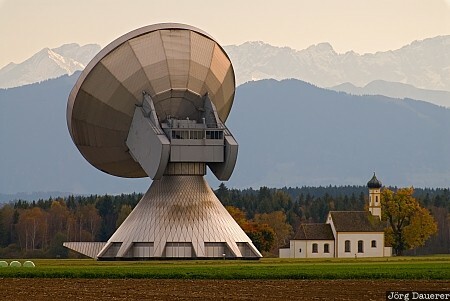 A satellite transceiver dish of Erdfunkstelle Raisting with the small baroque St. Johann chapel and the Bavarian Alps in the background. Raisting is in southern Bavaria (Regierungsbezirk Oberbayern), Germany. This photo was taken in the afternoon of a sunny day in October of 2008. This photo was taken with a digital camera.